While much has been written about the negative consequences of his, er… less-than-stellar, management acumen, his trend toward centralisation and exclusion of opposing views, to me the most significant element of his legacy is his energetic contribution in turning the Bank further away from its development mandate and into a poster-child for corporatized and financialised development (if one can use this word here). His contribution to the social, environmental and fiscal race to the bottom (think new environmental and social safeguards) inherent in the Bank’s drive for an ‘enabling environment’ necessary to attract private sector investment ‘for development’ will have a lasting impact. At a deeper, structural level, his evangelism for the Bank’s ridiculously misnamed Maximising Finance for Development’s (MFD) private sector-first approach has ensured the Bank significantly contributed to the very dynamics of rising inequality, exclusion and lack of state legitimacy many rightly blame for the rise of nationalist and ‘anti-establishment’ parties. Given trends in the world economy, no one should have been surprised by the fact that multilateralism has become so toxic. As they say, “with friends like that”…. While the application of MFD and the resulting de-legitimatisation of the state through privatisation of provision of essential services (witness IDA’s private sector window) has not featured in discussions about IDA and the Bank’s focus on fragile states, Kim will also leave behind a disturbing legacy in this regard. While I realise he can’t take all the ‘credit’, the good doctor must be given his due for his contribution in ensuring that, as he often stated, the relationship with the other MDBs, including the BRICS Bank (there is a joke somewhere in here about bricks, sinking hopes, etc) and AIIB became indeed one of cooperation among depressingly similar lines. So much for the rise of a radical South-South development paradigm. 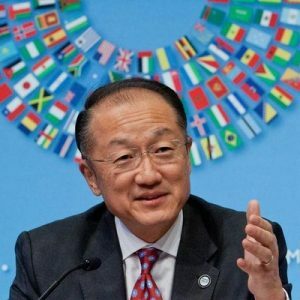 This entry was posted in The Process, Uncategorized and tagged candidates, international development, jim yong kim, privatisation, World Bank by Luiz Vieira. Bookmark the permalink. That said, there’s ample space for private competition in the provision of social services, particularly where state capacity is limited or state institutions are imprevious to reform. The record on water, on education, and on health is mixed, both on financing and delivery. Ultimately, the test on public goods must be whether they are inclusive, and is a nation satisfied with a system–state or private–that leaves anyone behind. Dr Kim’s energies on health, for example, were all over the place, and faddish in the extreme, to the detriment of provision of basis services, advances on universal coverage, and doing the simple things to monitor public health, diseases, and epidemics.